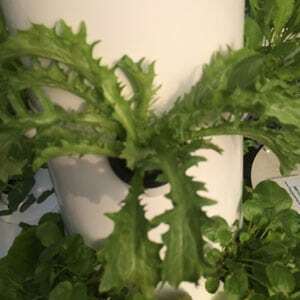 Narrow, frilly, blanched leaves for salad mix. Rhodos is a small endive technically of the French Trés Fine Maraîchère type, often referred to as “frisée” in the salad mix trade. Smooth but deeply cut, toothed pale-green leaves. Mild flavor. Full-size heads form a mass of tender blanched leaves at the heart for salad mix. Like all T.F.M. types, it can be sensitive to tipburn (particularly in hot weather) and requires an attentive grower. HARVEST: Clip individual leaves or harvest whole head by cutting with a knife just above the root attachment. Cool quickly by dunking in cold water, drain, and refrigerate.